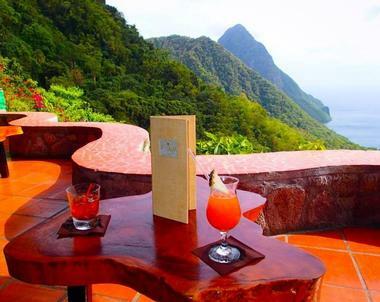 Ladera Resort is situated on the beautiful island of St. Lucia in the Caribbean and is one of the top resorts on the island. It is the only resort on the island located on the UNESCO World Heritage Site. Its open wall concept is loved by all of its guests with natural beauty, forestry and the Caribbean Seaoffering breathtaking views from every room and every angle at the resort. This year around resort is the perfect place to unwind and relax and is a very popular honeymoon spot. 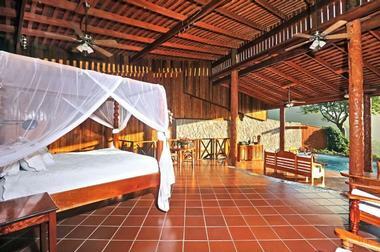 The resort has 32 suites and every room is decorated with local artwork, furniture and hardwood, stone and tile floors. All guests of the resort receive nightly turn down service, complimentary wireless internet, shuttle service to the beach, and excellent customer service at the main hotel pool deck where hotel staff is ready to provide towel, umbrella, food and beverage service at all hours of the day. All guests get to enjoy their own private pool as well, which is situated right inside or outside their open wall suite. 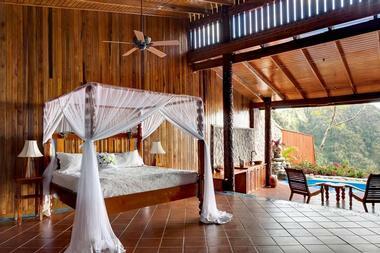 There are a few different style suites to choose from when staying at the Ladera. These include the Gros Piton Suite, the Rainbow Suite, the Hilltop Suite, the Heritage Suite or the Suites and Villa at Paradise Ridge. The Gros Piton Suite offers an open air bedroom with a queen sized bed and sitting area that has spectacular views of the Pitons and Caribbean Sea. This suite also includes a shower and a private non-heated plunge pool. Guests can also enjoy a continental breakfast served every morning and coffee and tea at all times of the day. The Rainbow Suite is another glamorous option for guests. 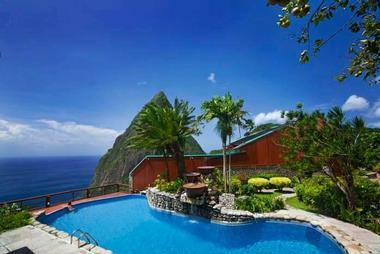 This suite offers a similar set up and amenities like the Gros Piton Suite. Like the Gros Piton, it offers amazing views of the hillside and ocean, and has a spacious bedroom and sitting area which accommodates up to two people. The Hilltop Dream Suite is incredibly fancy and luxurious. This suite also sleeps two individuals but offers a king sized bed, an open sitting area, a heated swimming pool with a swing, and a minibar full of water, soft drinks and local beer. Guests of this suite can enjoy a full breakfast every morning and coffee and tea at all hours of the day. This 1,200 square foot suite overlooks both the Caribbean and valley. Guests who are looking for the largest suite available, should check out the Heritage Suite. This is the largest suite at the Ladera Resort at 2,400 square feet. The Heritage Suite is located on the ground level but consists of two levels. The first level includes a dining area within a large open air living roomand the second floor showcases an open air master bedroom and a shower. Guests of the Heritage Suite also receive a full breakfast every morning, their very own heated swimming pool, and a minibar full of snacks and soft drinks. Dasheene is one of the best restaurants St. Lucia has to offer. Offering unique, trendy yet delicious menu items, the restaurant gets very busy and reservations are highly recommended. The restaurant is open for breakfast, lunch, and dinner, and offers Sunday brunch as well. Some of the restaurant's menu items include omelets, a tropical fruit plate, and homemade pastries with jam for breakfast and traditional St. Lucian dishes like sweet potato and coconut soup, roasted conch, and smoked poulet served with a coconut salad or a Salt Fish dish and green fig salad for dinner. The restaurant also has an extensive dessert menu which includes the restaurants James Beard award winning Coconut and Banana Brulee and other delicious treats like Rum and Banana Cheesecake with local coffee sauce drizzled on top and Chocolate Rum Mousse. The Executive Chef, Nigel Mitchel, sources locally as much as possible and uses the freshest native ingredients from local farms and plantations in all of his dishes. If guests are looking to celebrate a special occasion like an engagement or a romantic night with a loved one, they can choose to dine at the Wine Cellar as well. The Wine Cellar is a separate venue within the Dasheene, and offers a private dining experience with a private server who is happy to suggest menu items and wine pairings for an entire night of eating, drinking and relaxation. Guests can choose to purchase pre-paid meal plans during their stay as well through the resorts front desk. All plans are priced per person. Guests can select a Modified American Plan which offers a full breakfast and dinner, a Full American Plan which includes a full breakfast, lunch and dinner or the All Inclusive plan which includes a full breakfast, lunch and dinner as well as afternoon tapas, and soft drinks, house cocktails, and spirits by the glass. Guests will not go hungry or remain thirsty during their stay at the Ladera Resort. Ladera is a popular location for destination weddings. With fantastic views of the ocean, mountains and hillside, there is no better place to say “I do.” The hotel has wedding specialists who will coordinate all details of the wedding, who will be there on the special day to help with any last minute items. The bride and groom can choose from three different wedding packages. These are the Romance in Paradise package, the Wedding in Paradise package, and the Villa at Paradise Ridge venue. The Romance in Paradise package ceremony is only available in the privacy of ones suite and includes all legal requirements and transportation costs to the resort as well as a Marriage officer and witnesses if needed. The Wedding in Paradise package is also only available in the privacy of the guests hotel suite and includes the same items as the Romance in Paradise package, as well as a floral wedding arch, a bouquet for the bride and boutonniere for the groom, champagne and small bites, a photograph package, an hour of entertainment, a wedding cake and wedding gift for the newlyweds. For those looking for an extravagant, larger scale wedding, the Villa at Paradise Ridge venue is a great option at the Ladera Resort. The Villa at Paradise Ridge is situated in a beautiful open-air location along the rainforest ridge next to the resort. Only one railing surrounds the villa, which is the only thing separating guests from the surrounding rainforest and landscape. Wedding receptions can be catered by the team at Dasheene Restaurant, who are also happy to customize menus for the bride and grooms special day. The Ladera Resort offers many different activities for its guests to take part in during their stay. These range from live entertainment, bartending classes, sunset cruises, and fish Fridays to name a few. The Dasheene restaurants offers live entertainment every day from 6:00 pm to 9:00 PM for guests and visitors of the hotel. The hotel also offers a cooking demonstration class where guests can learn how to make some of Dasheene’ s best Caribbean dishes and a bartending class where guests can learn how to make tropical cocktails. Fish Fridays are held every Friday night in a nearby fishing village and include a night full of sea food, drinks and entertainment. Guests can reserve a spot on the boat to get to the party. For those who love the water, the resort also offers sunset cruises, evening sails, whale and dolphin watching tours and glass bottom boat tours. The Sunset cruises go out at four in the evening to capture the breathtaking sunset on the water. Guests get to enjoy complimentary drinks and appetizers while they cruise and admire the evening sky. The evening sail is another fun option and is great for snorkel lovers. This sail leaves from the port in the afternoon and offers snorkeling in the coral reefs where lots of tropical fish, coral, and ocean life can be examined and explored. After snorkeling, guests can enjoy drinks and appetizers for the ride back to shore. The hotel also offers hiking trails and horseback riding to guests who are looking to stay active on their trip. Two well-known trails include the Tet Paul Nature Trail and the Gros Piton Climb and Hike trail. The Tet Paul Nature Trail is located on St. Lucia’s World Heritage site and is quite a picturesque hike. It’s not too difficult and is roughly forty five minutes long. The trail is surrounded by exotic fruits, trees and medicine gardens. Guests who venture to the trail look out can spot neighboring islands, Martinique and St. Vincent. The Gros Piton Hike is difficult and only recommended to individuals without medical conditions and who are fit. 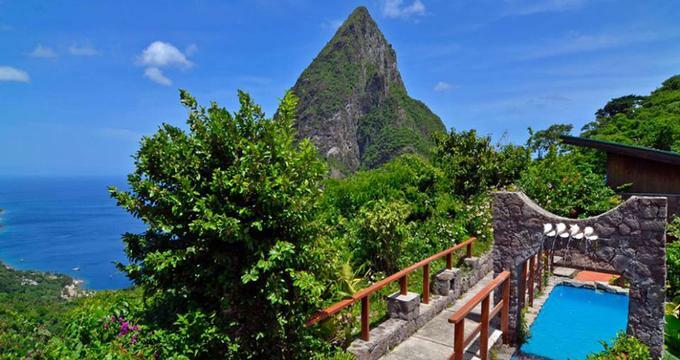 Hikers climb to the top of Gros Piton and can enjoy the sights below at 2,600 feet. Horseback riding is also a fun activity available to guests. Guests can hop on a horse and enjoy an hour long ride on the beach. There is plenty to choose from at the Ladera Resort and in the surrounding area. The Ladera resort is happy to make all reservations and organize accommodations for all guests, at their request.